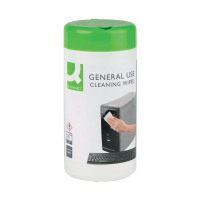 Multi-purpose cleaning wipes ideal for general office use. Helps to keep your desk and work area clean, easily cutting through grease more effectively than water. A quick and easy to use cleaning solution, this product contains 100 wipes, and is a high value alternative to branded products.